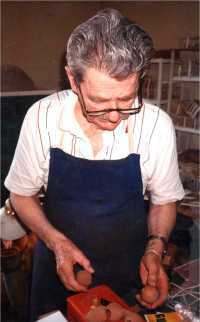 JAKOB GROTH leave us in August 2007 after a long enduring illness in his early 40ies. We will nerver forget his effort on pipes and pipe-related topics. This is a short history of Danish hand made pipemaking leading to a presentation of many of the Scandinavian pipemakers after WWII. The purpose is to give a general view of the environment in which this special handicraft art has developed, and to present the main people involved. This presentation does not pretend to be complete, so useful comments are encouraged and will be received with thanks. 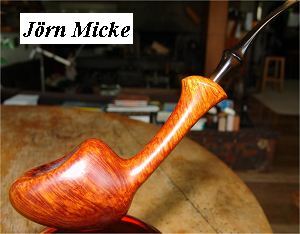 In the 50's Sixten developed his pipe shapes. From the traditional English shapes, starting with the Billard, he made a number of variations that were later to become classics. At the same time he started to collaborate with Stanwell. This also led Sixten to go into business for himself. Sixten had a disagreement with the owner of Suhrs Pibemageri about royalties for the shapes he created for Stanwell. Stanwell was the only Danish pipe factory started during the War that survived the later reentry of English pipes into Denmark. We shall return to Stanwell, even though it produces factory made pipes. Sixten was never been afraid to teach others, so many of Stanwell's modern shapes from the 50's and 60's are creations of Sixten Ivarsson. In this way Danish Design was spread worldwide by Stanwell just like it was spread with the popularity of modern Danish furniture. Typical for the Sixten School is that he always emphasized very good quality in the workmanship. All details must be done with a high degree of perfection. It was very important to Sixten that the pipes were good smoking instruments - even though the shaping of the pipes is more sculptural than in the other schools. 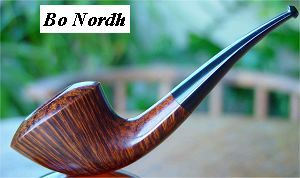 Many of these pipes can be seen as the work of a sculptor trying to make the most of the briar as an interesting material. This means that many of the pipe shapes are asymmetric, in soft and flowing shapes. Often the finish of the pipes is in a various shade of brown. We realize that when we are talking about characteristics, you have to see dozens of pipes from different pipemakers from a School before you can see a common thread. At the same time, some of these pipes may not have the characteristics of the School.